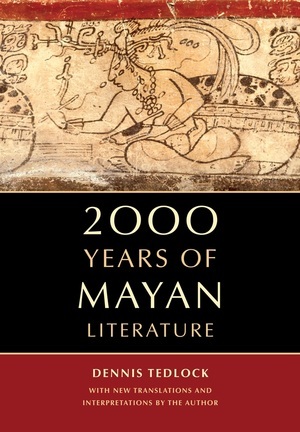 Mayan literature is among the oldest in the world, spanning an astonishing two millennia from deep pre-Columbian antiquity to the present day. Here, for the first time, is a fully illustrated survey, from the earliest hieroglyphic inscriptions to the works of later writers using the Roman alphabet. Dennis Tedlock—ethnographer, linguist, poet, and award-winning author—draws on decades of living and working among the Maya to assemble this groundbreaking book, which is the first to treat ancient Mayan texts as literature. Tedlock considers the texts chronologically. He establishes that women were among the ancient writers and challenges the idea that Mayan rulers claimed the status of gods. 2000 Years of Mayan Literature expands our understanding and appreciation not only of Mayan literature but of indigenous American literature in its entirety. Dennis Tedlock is Distinguished Professor and Endowed McNulty Chair of English and Research Professor of Anthropology at the University at Buffalo of the State University of New York. He won the PEN Translation Prize for Popol Vuh: The Mayan Book of the Dawn of Life and the Glories of Gods and Kings. For his other books he has received awards from the American Folklore Society, the Society for Linguistic Anthropology, the Society for Humanistic Anthropology, and the Association of American Publishers.